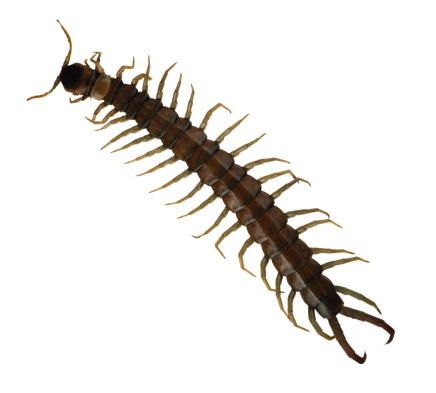 Basements are a prime entry point for insects because many invading pests primarily crawl, such as ants, roaches, beetles, silverfish, and spiders. By spending as little as one hour you can keep bugs out of a finished basement by locating and removing or repairing their entry points, removing things that attract them to your home, and if necessary applying an insecticide barrier treatment. Turn off the lights in the basement and look for areas, especially around doors and windows, for outside light penetrating in. Walk around the outside of your basement and look for any cracks or crevices that could potentially allow entry into your home. Pay particular attention to areas where plumbing and wire enter. Look for things that are attractive to insects outside such as mulch next to the foundation, excess foliage (particularly if it touches your home), and other debris such as leaf clutter. Replace damaged seals around windows and doors and apply caulk to any areas where you found light penetrating the room. Fill gaps that you find outside that are large enough to put your finger in with steel wool followed by expanding foam or caulk (this prevents mice from entering, as well as bugs). Fill smaller gaps with ordinary latex caulk. Remove all debris with 2 feet of your home's foundation, including raking leaf clutter, trimming back foliage, and pulling back mulch (river or lava rock separating the mulch by 2 feet is a good option). Purchase a residual pesticide that is labeled for the treatment of a large variety of pests (most products are). Mix according to the label instructions in a pesticide applicator. Several effective pesticides are eco-friendly, made with botanical ingredients. Spray a barrier treatment around the entire foundation of your home that is 2 feet out from the house and 2 feet up. Reapply the spray according to the label instructions. Usually they specify monthly treatments. Spread a granular insecticide for longer-lasting results than sprays. Use a handheld broadcast spreader to spread the granular product completely around your home in a 2-foot band. Granular products are superior to sprays in that they are activated by and slowly broken down by water, whereas rain renders sprays useless. Reapply according to the label instructions. Use glue boards that you can fold into cylindrical boxes and place near entry points such as doors that lead outside and around possible sources of food and water. Monitor them regularly to check the effectiveness of your treatment and repairs.